That beautiful blue, originally uploaded by Ms._Pearl. I think this is my favorite mosaic so far. Not sure what this color is–aqua, teal? Whatever it is, I love it. 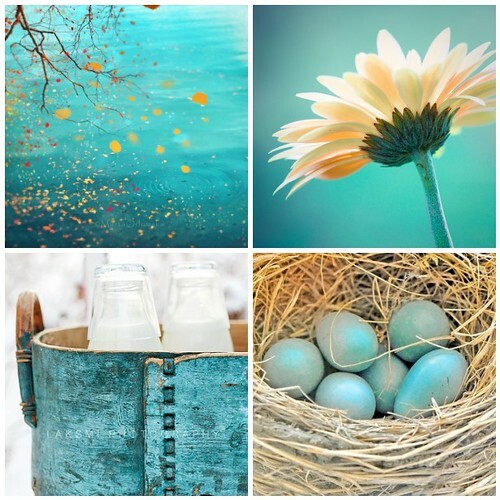 This entry was posted in photography and tagged bottles, bucket, eggs, flower, leaves, mosaic, nest. Bookmark the permalink. Love this. Especially the blues. Blue robin eggs always bring to mind springtime for me. Thanks for including your link to how you created the mosiac. It is something I’d like to try with some of my photos but didn’t know how you did it. Glad you got the link, Jeanne. I tried blogging directly from Flickr this time, and it published with no chance for editing! I then added the links and hit “update.” Won’t be blogging that way again soon. Let me know if you need any help with the mosaic maker. It’s easy once you know how, but can be tricky the first time. Be sure you upload the photos in the order you want, because there’s no rearranging once they’re selected. You have to do the whole thing over again until they’re arranged the way you want. I tend to follow the default setting for spacing too. There are all kinds of fun things to do at bighugelabs.com, where the mosaic maker can be found. I’m loving it too, Carole. Whatever shade of blue that is you have an incredible eye for capturing it in each piece of your mosaic! I’ll have to check out Flickr Toys! The shot in the upper left would make an excellent book cover for a tale of romance and gentle, deep love. Hmmm don’t know where that just came from, but I think it has something to do with the promise of spring in your mosaic! Beautiful work. What a great idea, Cheryl. Your next book perhaps? I agree, Caroline. Speaking of books, I ordered Love Virtually. Mm I love blue almost as much as periwinkle. Oooo! This looks like Tiffany blue to me! Gorgeous, gorgeous shots! It’s very close, huh? Thanks! Loved your post today, Maura…. I agree with Maura that it’s kind of Tiffany blue. Love, love, love the gerber daisy. Thanks for the link…going there to check it out now! Me too. I know the photographer and she is wonderful. This is my favorite things that you post 🙂 I just love these collections. They always put a smile on my face and inspire me! Thank you!!! !